Intermittent partial closures are currently in place along Genesee Avenue in support of Trolley bridge construction. Crews are installing pre-cast girders, which are large beams used to support the Trolley bridge. The girders will be placed on top of the columns to build the viaduct, which is the bridge structure that will carry the Trolley along its route. Full closure of southbound Genesee Avenue lanes and Esplanade Court intersection. One lane open on northbound Genesee Avenue. Two lanes open on southbound Genesee Avenue. Two lanes open on northbound Genesee Avenue. Right turn lane maintained on Esplanade Court. 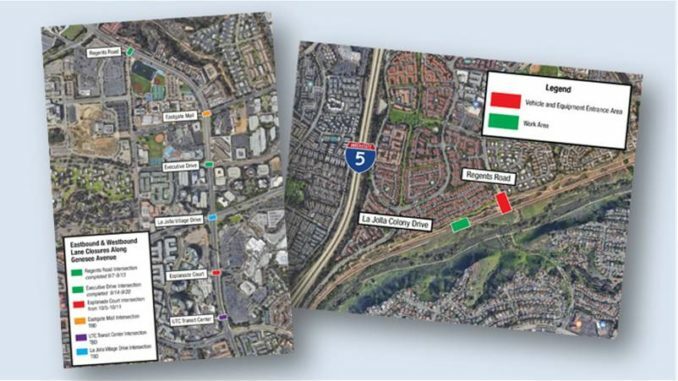 Additional Genesee intersection closures to be announced for La Jolla Village Drive, Eastgate Mall, and UTC Transit Center north of Nobel. Beginning Tuesday, October 16, through Wednesday, November 14, crews will be constructing a maintenance vehicle access road turnaround in the canyon south of Regents Road. Although the work will be in the canyon, construction crews will be using Regents Road to access, store, and transfer equipment and materials to the work site. Information provided to University City News and UCCA by Shift San Diego.